Secure parking-park right in front of your room. gas station and supermarket nearby. Beautiful ground keeping. Very compact and fitted a family of 2 adults, 2 children and a baby in one room. Comfortable beds and friendly staff. Extremely comfortable bed, room spotlessly clean, good choice of food for breakfast and there was something to please everyone. I use Campanile hotels frequently all over France so I am always expecting the same product, restaurant, location, rooms etc. Staff were friendly, helpful and spoke English. The restaurant provided good meals at a reasonable price and the continental style breakfast provided plenty of choice. Adequate on-site parking was provided and there was a supermarket nearby. The property was outside the main town and easily accessed from the motorway heading south. Bed was satisfactory, Parking area was very good & spacious. The staff, location and parking is just what is required whilst making a long journey for a convenient stop over on the route south. Located 1.2 mi from the Millau Train Station, this Campanile Hotel is easily accessible from the A75 Motorway and the Millau Viaduct. It offers accommodations with free Wi-Fi. 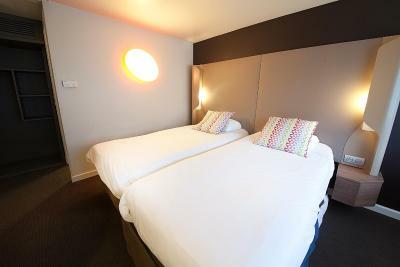 Rooms at Hotel Campanile Millau have a private bathroom and are equipped with tea and coffee making facilities and a TV. A full breakfast buffet is served daily at the Campanile Millau Restaurant, which is open 7/7. Meals can be enjoyed on the terrace during summer. 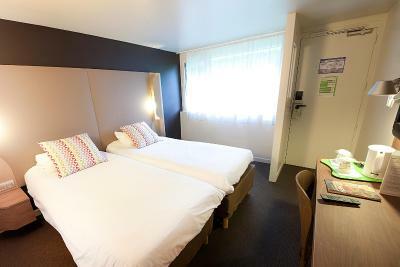 The Campanile Millau Hotel provides free private parking and is 9.3 mi from the Micropolis Museum. The Cevennes National Park and the Roquefort cheese caves are a 30-minute drive away. 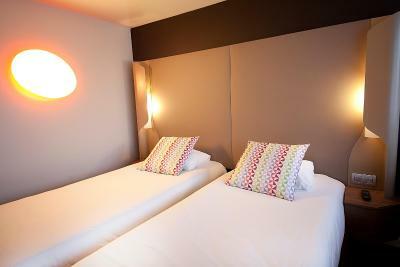 When would you like to stay at Campanile Millau? 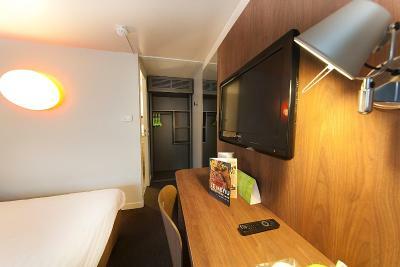 Free WiFi, a TV and a private bathroom feature in this room. House Rules Campanile Millau takes special requests – add in the next step! Campanile Millau accepts these cards and reserves the right to temporarily hold an amount prior to arrival. Please note that the car park is closed from 23:00 to 06:00. The breakfast is served from 06:30 to 09:00 on weekdays and from 07:00 to 10:00 on weekends. Restaurant is open from 12:00 to 14:00 and from 19:00 to 22:00. Hotel is apparently undergoing a lot of work, builders vans parked haphazardly in car park. Room completely devoid of character. Evening meal very basic and not of standard I'd expect in a hotel, more like a works canteen. Oddly no hand soap in bathroom, the only soap was shower gel in a refillable holder over the bath and that was only enough for one person for one night. For what you get I think this hotel is overpriced. It was advertised with tea and coffee facilities. There were any in the room. It looked like it had just been redecorated. Compared to other Camapniles I have stayed in, this was very tired and desperately in need of an upgrade. I did however notice that some of the rooms are currently undergoing a refurbishment so with that in mind I would not hesitate to come back here again when the rooms are the usual standard I would expect from a Campanile. The property decor and presentation were a little dated and in need of a spruce up. Bags had to taken up one flight of circular stairs but this was possible without too much inconvenience. I felt everything was up to standard, we have stayed there 3 times now and would stay again. New management have just taken over & Campanile in need of refurbishment which is planned over next 2 years - ideal as overnight stop as just off A75. All the basics are there to make this into a lovely place to stay.